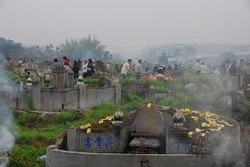 Chinese societies respect and worship ancestors. 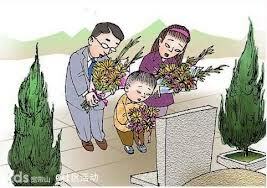 China, Taiwan, Hong kong and Macau all defined Tomb Sweeping Day as a National Holiday. 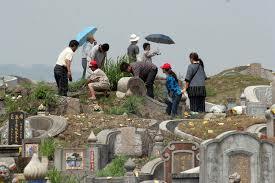 It occurs around April 5 when family members get together for sweeping the tombs of their ancestors and deceased families or relatives. 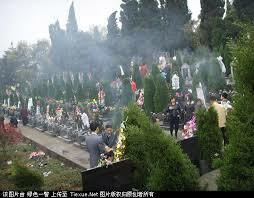 Tomb Sweeping Festival (扫墓节） is also called Qingming Festival (清明节). It falls on the 15th day from the Spring Equinox, usually around April 5 of the Gregorian calendar. Astronomically it is also a solar term. 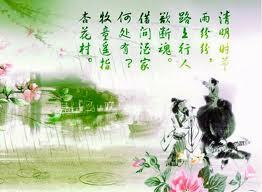 The Qingming festival falls on the first day of the fifth solar term, named Qingming. 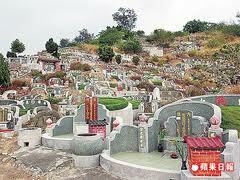 This day is also named Clear and Bright Day, denoting a time for people to go to the graves of departed ones at the Spring time, a revival season of a year. 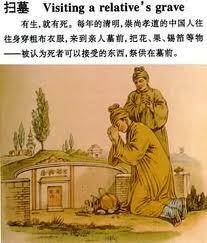 Tomb Sweeping Day is a day to commemorate and honor the ancestors on their grave sites. All family members pray before the ancestors, sweep and clean the tombs by weeding and plowing. 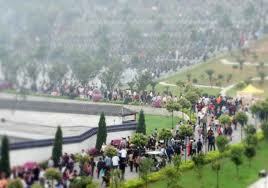 Chinese cakes, meat, fruit, tea, wine, flowers are offered. Joss stick and paper money are usually burned for wishing ancestors a great life in their world.